“What is that? Velvet?! ?” Name that movie or we’re no longer friends! Just kidding but these booties though!!! There is no denying that Crushed Velvet has made a comeback in a major way. It is definitely on trend this fall and I am totally here for it! The luxe sheen and soft texture completely lures you in! Unlike traditional velvet, crushed velvet adds a little more va-va-voom to the look of the fabric. The crinkly texture creates shadows and dimensions making the fabric a statement in itself! 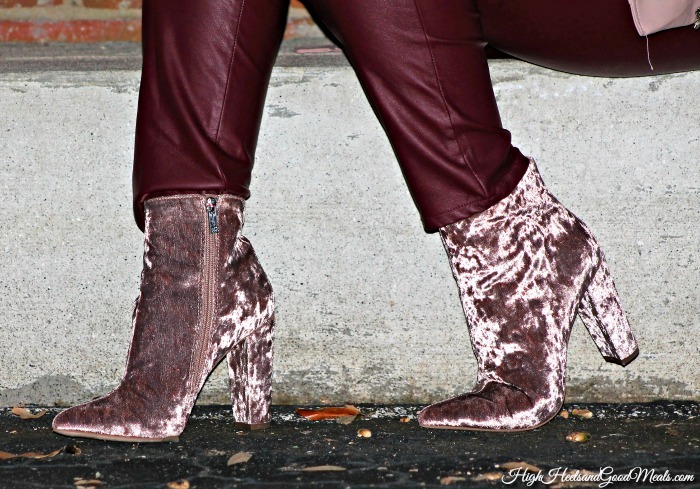 When I saw this amazing pair of crushed velvet booties from the fab, online shoe boutique, An Unlikely Pear, it was highly likely I had to have them! I am literally obsessed with these booties! You all know I love my heels and I am completely smitten by these. They’re definitely a show stopper and an attention getter. I received tons of compliments from my entire look that day but most were enamored with these Teddi Crushed Velvet Ankle Booties, honey! We won’t even talk about how many times I was caught petting my shoes! Ok, ok, so I really just wanted to make sure I kept them spiffy. Velvet is hard to clean! 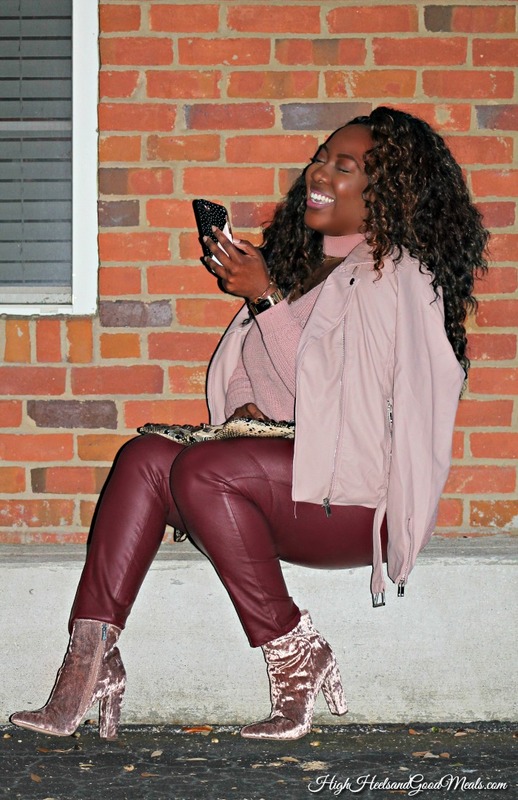 Rose gold, blush, mauve, and pink hues in general, are some of my favorite colors so the fact that these baddies are blush may have quite easily made these my new favorite pair of shoes. I am going to get plenty of wear out of them this season! I can promise you that! 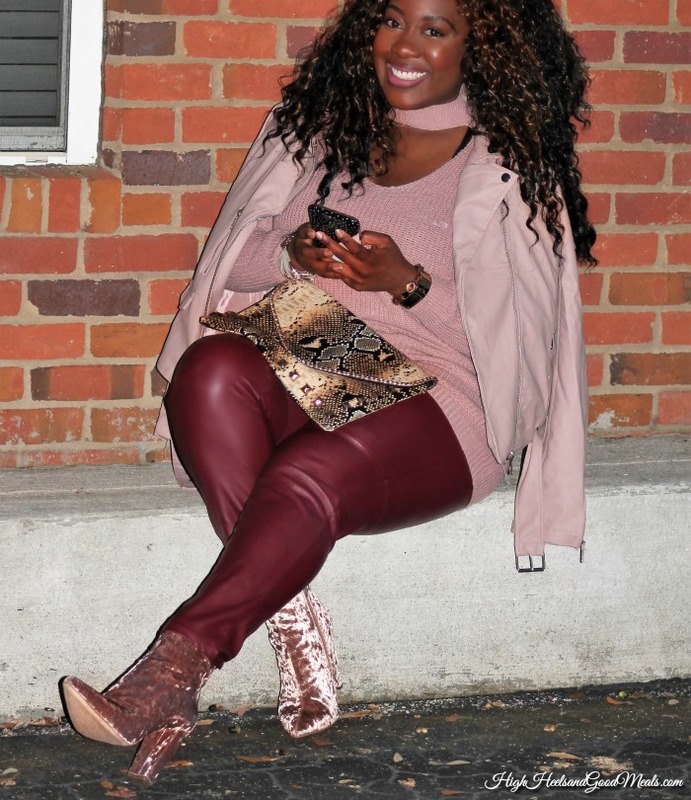 Leather goes great with crushed velvet! The contrasting textures compliment each other perfectly! 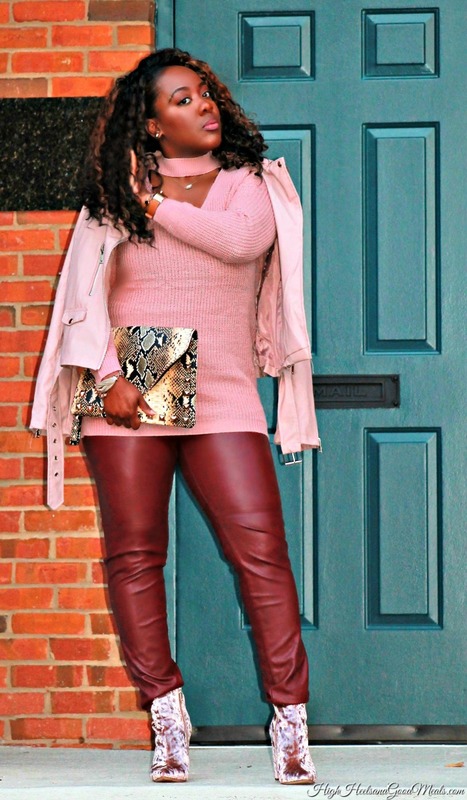 Burgundy and blush look amazing together as well so I grabbed my blush choker sweater and leather jacket, burgundy leather pants, and these new blush crushed velvet booties and IT WAS A LOOK! 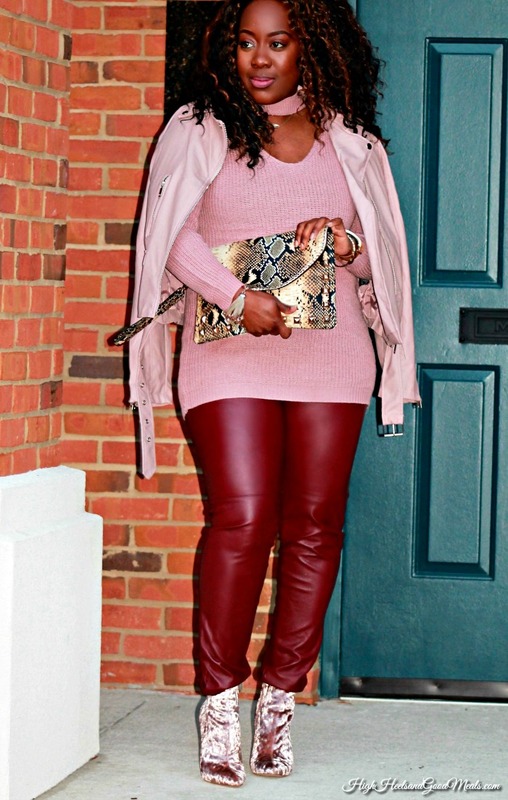 My snakeskin clutch tied the entire look together! I was totally feeling myself! Can you tell? Sidenote: Did I mention it is still hot as balls in Florida…in November? Yeah, soooo, the jacket had to come off but your girl was still cute! So let me tell you about An Unlikely Pear…yes pear as in the fruit! 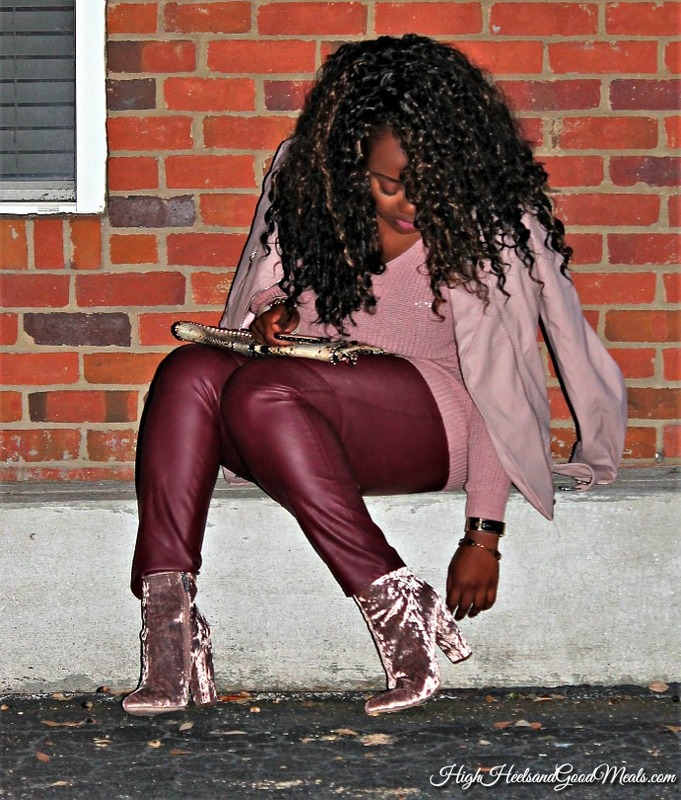 They are a fun and trendy online shoe boutique based right here in Jacksonville! They have exceptional customer service and I absolutely love their story behind using the word “pear” instead of pair. Here’s the scoop…shoes and fruit have a lot in common. They both come in many shapes, sizes, colors, and types. Fruit have a short shelf life as sometimes shoes go out of style. Plus the pear happens to be the brands favorite fruit and a homonym for pair so it totally works! Fun right?!? Do the unexpected! I love it! I know you love these booties as much as I do and now you have the chance to get yourself a pair! If you shop An Unlikely Pear now, you can get 10% off of your purchase with the code HIGHHEELSGOODMEALS. 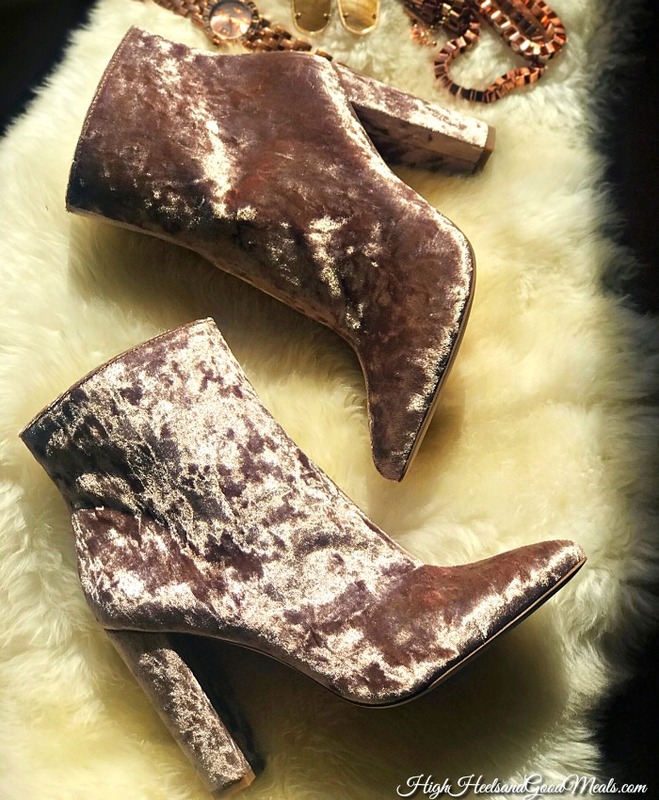 If you’re really feeling froggy, jump on this giveway for your very own pair of Crushed Velvet Booties (here) or Leopard Print Booties (here)! I know right! (Where are the laptop emojis when you need them?!) One of my lucky readers will win one of them. 3.) Leave a comment telling me which pair of booties you absolutely have to have and why! The giveaway will run here, on Instagram, and Facebook until next Thursday, November 16, 2017. I will announce the winner on my Instagram stories! This is an amazing giveaway! The winner is going to love their new pair of booties! As always thank you so much for stopping by and for your continuous support! You’re all appreciated! Have a great day and good luck! Disclosure: This post was sponsored by An Unlikely Pear, however my opinions are 100% my own. Ummm, both are beautiful, but I am an absolute sucker for anything animal print so those would be the ones I would pick!! Omg those animal print ones are so GORG!!! I am a sucker for animal print and it’s so hard to pass up but those crush velvet booties are every.thing and I don’t wanna be without them. Thanks for hosting an awesome giveaway! 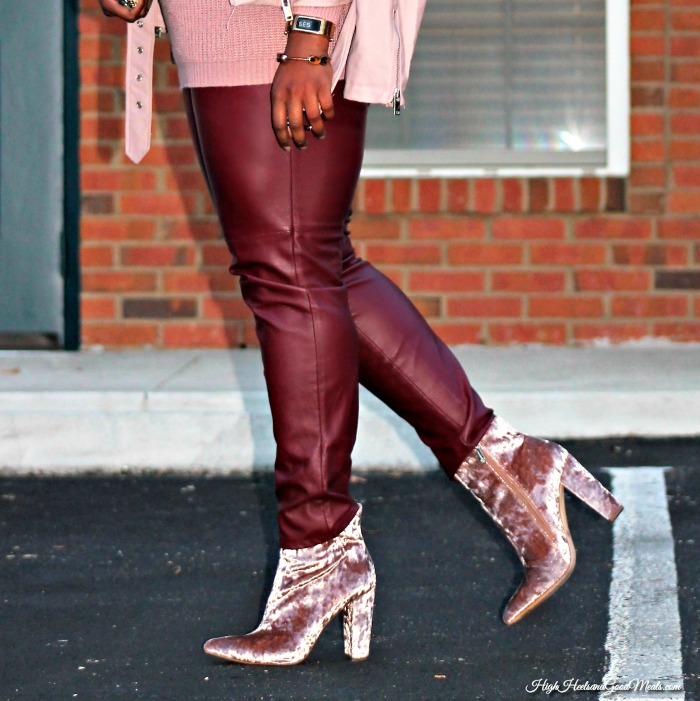 Those animal print booties are the best! You are very welcome!